- The episode starts off by flashing back to Rick still in the hospital. Shane attempts to get Rick out and away from the “Walkers,” but he doesn’t know what to do. He thinks that Rick is dead, so he retreats but not before blockading the door with a gurney. - The group enters the CDC where they meet the scientist, Jenner. They learn he is the only one left. He subjects them to blood tests before they drink, eat, shower, and relax. - While drinking and eating, Jenner explained what happened to the rest of the people. Some escaped, but many chose to commit suicide. - Andrea is still dealing with the death of Amy. She sees no hope left. - Rick gets a little drunk and confesses to Jenner that he too feels that it’s only a matter of time before the zombies get them. - Shane is also drunk. 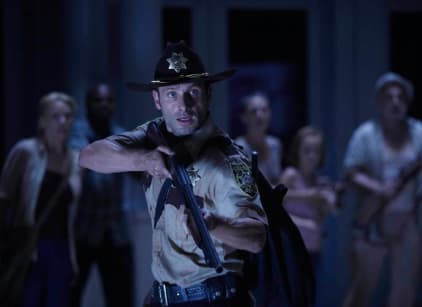 He confronts Lori about his feelings for her and tries to explain what happened when he left Rick at the hospital. He makes aggressive sexual advances but Lori scratches him off. - Jenner shows the group a video of subject TS-19. It illustrates a visual look at the death of a person after they are bitten, followed by their resurrection. - Jenner doesn’t know what causes the transformation. He has no contact with anyone else to learn more either. - The group learns that there isn’t much fuel left and the CDC is going into shutdown mode with a timer that leads to widespread contamination. Essentially it is a bomb that wipes everything out to stop all of the rare diseases inside from escaping. - Jenner locks the group in and explains that killing them all is a way to end the suffering. - He eventually reveals that TS-19 was his wife. Jenner finally releases the locked doors. He also whispers something to Rick before the group runs towards the exits. - Andrea and Jacqui choose to stay and die. Dale convinces Andrea to go with him and they do, right before the explosion. Rick breaks the glass with the grenade he found from earlier in the season. - The CDC explodes and the group drives away towards an unknown destination.